During the colonial period and the nineteenth century, young women received an education that was related to their status in society. Daughters of wealthy white families learned to read and write, to sew, to manage households and kitchens, and to guide the early religious and moral training of their own children. Daughters of poor white families and the daughters of slaves or free African Americans may never have learned to read and write. Instead, they received occupational training according to their parents' position in life and their own expected prospects, such as cooking, washing, sewing, field or factory work, or other manual or service tasks. Virginia's modern public school system evolved after the Civil War from private academies and church schools. The new public school system not only allowed girls and boys to study the same academic subjects, but the schools also offered new employment opportunities. 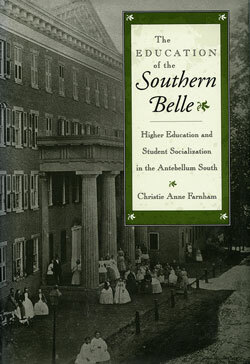 Admission of women to public institutions of higher education began with the establishment in 1884 of the first of a series of normal schools to prepare young single white women for careers in teaching. Until the twentieth century, men dominated administrative jobs such as principals and superintendents in many cities and counties. Women were not admitted to full members or allowed to hold office in some state and national educational associations until the 1900s. Changes in educational opportunities for Virginia's young women and a widening of educational vocations for women paralleled changes in economic and social conditions in the United States. Women were admitted finally to all the undergraduate schools of the University of Virginia in 1970. In August 1997 Virginia Military Institute, then the last all-male public institution of higher education in the United States, admitted its first women cadets, years after the national service academies had admitted women, who were taking on enlarged responsibilities in all branches of national defense. Young white women, as with young white men, were often educated in the home or attended classes conducted by a schoolmaster, who was often also a clergyman. Throughout much of the eighteenth and nineteenth centuries, education was a responsibility of the church, not of the state. Many of the finishing schools and academies that opened in Virginia during the nineteenth century were under the direction of clergymen, and some of them offered a rigorous academic curriculum.